Recent reports that President Donald Trump has ordered the withdrawal of American troops from Syria, if true and not a ruse, signal what could be one of the last steps towards triumph for Putin over the West in that Islamist-torn country. Washington under the Obama administration overplayed its hand by undertaking a Muslim Brotherhood strategy that not only threatened Egypt, Libya and Syria but also Turkey. The coup de grace was the illegal deployment of American, Turkish and other Western countries’ troops in Syria without a mandate either from the legal if unpalatable regime of Bashar Assad or the United Nations. The results have been nothing but bitter fruit for Syria’s and the Arab world’s peoples, the empowerment of Al Qaeda (AQ) and the Islamic State (ISIS) across the region and lengthening the long war that is necessary for destroying the jihadist and Islamist menace. By creating a military and diplomatic combination involving Iran and NATO member Turkey, Putin has gone a long way towards fully isolating the United States and the entire West from the military and political negotiating process of resolving the Syrian war. Ankara’s tilt towards Moscow and Teheran and away from its NATO allies in Syria also has raised the issue of the viability of Turkey’s membership in NATO, which could redound to Moscow’s advantage beyond the ‘mere’ weakening of NATO’s southern flank. The only question remaining is whether Moscow and its allies can see the Syrian peace and re-stabilization processes to the end. Trump inherited a mess in Syria created by the Obama administration’s failed and ill-conceived Muslim Brotherhood strategy for the Middle East, as I have detailed elsewhere (https://gordonhahn.com/2016/03/05/the-obama-administrations-muslim-brotherhood-strategy-and-the-war-against-jihadism-parts-1-and-2/; https://gordonhahn.com/2016/04/03/obamas-muslim-brotherhood-strategy-the-war-against-jihadism-and-russias-syria-intervention-part-3-obamas-america-and-erdogans-turkey/; and https://gordonhahn.com/2017/02/15/american-misadventures-and-russian-gains-obamas-muslim-brotherhood-strategy-general-flynns-russia-play-and-trumps-debacle/). Obama supported at least politically the MB’s overthrow of the Mubarak regime and continued to support the new regime even after it committed numerous outrages against the opposition and left attacks against Coptic Christians unpunished. In Libya, the Obama administration and its European allies violated the UN resolution on creating a NATO-enforced no-fly zone in Libya, which forbade intervention on behalf of either side in the civil war. Instead of abiding by that resolution, upon which the fate of a second term for then Russian President Dmitrii Medvedev may have hinged, Western forces pounded Qadaffi’s forces from the air leading to Qadaffi’s death and murder and his regime’s overthrow. The Libyan rebels who destroyed Qadaffi and his regime were not democrats but rather a motley crew of tribal elements, jihadists like AQ and ISIS, MB and other Islamists. Then Secretary of State Hillary Clinton, at Obama’s behest, coordinated the State Department’s and CIA’s secret and illegal running of weapons to the then MB-dominated but increasingly jihadi-infiltrated, anti-Assad rebels in Syria—hence the massacre of US ambassador and CIA agents in Benghazi—hence the coverup of the massacre as a supposed spontaneous response to a little known Internet video clip rather than as the pre-planned AQ attack that it was. The AQ attackers’ knowledge of the meeting of the American and Turkish ambassadors could only have come from the Americans’ interlocutors in the arms deal — the MB, demonstrating the MB-AQ alliance or at least tactical partnership. The MB-jihadi alliance was not confined to the Libyan revolt; it was extant in the Syrian revolution and explains the acquisition of Western weapons by the Jabhat al-Nusra and ISIS in Syria, delivered by closely allied Muslim Brotherhood fighters or defectors from the ‘ikhwan’ Islamists to the jihadists. Obama and Clinton were warned about the likelihood of weapons ending up in the hands of jihadists like ISIS, but those warnings were ignored in the zeal to gain a ‘US foreign policy victory’ and ensconce in power across the Middle East, the Muslim Brotherhood, which Obama was less inclined to see as a malignant force compared with the military regime in Egypt, the increasingly cooperative Muammar Qadaffi, and the tentative, moderate ‘reformer’ (in Clinton’s words) Assad. 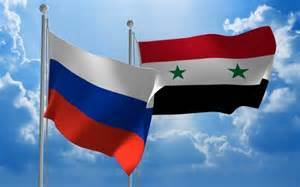 Putin intervened in Syria for a myriad of reason: to protect Moscow’s Syrian ally from another Western-backed color revolution; preserve Russia’s role as a player in the Middle East, and destroy or at least prevent the strengthening of Russia’s own terrorist threat represented by the North Caucasus-based, AQ ally, the Caucasus Emirate, mujahedin and potential recruits of which had flooded into Syria and Iraq to gain experience and allies for a return home and intensification of jihadi there. Putin’s effort has so far worked perhaps better than originally hoped. It has not only nearly defeated the jihadists in Syria, weakened Russia’s jihadists, protected Assad, and squeezed the United States and the entire West out of the process of resolving the Syrian war at least for now. The recent Russian-Iranian-Turkish (RIT) summit held in Istanbul committed all parties to backing the normalization process. Not only has Trump supposedly called for a withdrawal of US forces, he has frozen $200 million of humanitarian assistance intended for territories in Syria not under Damascus’s control. This is probably because of Damascus’s control over the overwhelming majority of its territory and the theft of humanitarian aide by rebels in areas where Assad has still not established full control. The RIT alliance has only to finalize the cleansing of East Ghouta, Turkish control of Afrin, and the destruction of ISIS’s last refuge in Yarmuk. The last town is of considerable symbolic importance, since it is the site of Mohammad’s first major military victory on behalf of Islam’s expansion, paving the way for its military conquests across the Middle East, North Africa, and into the Iberian peninsula. Moreover, Istanbul is cozying up to Moscow in trade, including nuclear energy and military contracts. Erdogan and Putin inaugurated the start of construction of Turkey’s first nuclear power station, the Akkuyu plant, by Russia’s RosAtom under a $20 billion contract. Putin also stated that Moscow was eager about concluding the contract to supply the S-400 air defense system to Turkey. This is not a NATO compatible system; quite to the contrary, it is designed to fight NATO aircraft. Erdogan expressed interest in other unspecified Russian military projects. In addition, construction has begun on the off-shore portion of Russia’s TurkStream pipeline that will run natural gas to Turkey and Europe, and talks have started on details for the on-shore branch. Diplomatically, Ankara was one of three NATO member-states partners that refused to expel Russian diplomats over the Skrypal alleged ‘Novichok’ attack in Salisbury, England. NATO member Turkey at a minimum is remaining neutral and is de facto supportive as regards Russian-Iranian military efforts to wipe out the terrorist and oppositional threats and preserve the Assad regime and is supporting the normalization process, while combatting Kurdish efforts to carve out an enclave and potential state. Thus, in Syria, Putin and his ally in Syria, Iran, have managed to ‘turn’ Turkey to the East after its unrequited (and not especially unlike post-Soviet Russia’s) quest to be included in the West. There are Kurdish reports that some of the remaining US troops that are essentially in Syria illegally are being re-deployed around Manbige to counter Turkey’s effort to wipe out a Kurdish stronghold there. Turkey’s transformation into a NATO rogue weakens the alliance’s southern flank, which is all important in the war against jihadism. Moreover, Turkey’s turn has posed the issue of the viability of Turkey’s membership in NATO, which could redound to Moscow’s advantage. US allies are being put in further disarray by Trump’s demand that the Saudis pay for any further U.S. operations, which could be the actual motive behind Trump’s withdrawal statement/threat. Russia is not out of the woods by any means, of course. One cannot exclude that Erdogan is playing both sides off against each other in order to sow chaos, of which he can take advantage to annex parts of northern Syria and be in a better position to destroy any potential Kurdish state that Washington might be try to help establish to punish Assad, preserve the threat to his regime, punish Putin and save face. Moscow is convinced that this Syria’s dismemberment is now one of Washington’s goals in Syria (www.ng.ru/world/2018-04-06/2_7206_siria.html). Turkish ambitions could undermine Moscow’s own RIT alliance, allowing for a revival of the Syrian opposition and renewed support from its foreign Western and Arab/Sunni sponsors. If Turkish ambitions remain limited to Syria’s far north or simply occasionally intervening there, leaving Syria and the Assad regime intact, then Moscow can tolerate such self-aggrandizement in return for Turkey’s continued trade cooperation. If Turkey leaves or is excluded from the alliance, it could become even more firmly oriented towards the East. In such case, it could very well join various Russian- and/or Chinese-led international organizations such as the Eurasian Economic Union, the Shanghai Cooperation Organization, and BRICS. After a Russian triumph in Syria and a Turkish defection East, others in the larger Middle East/North African (MENA) region and Muslim world are likely to become more accommodating of Moscow and, where applicable, less anchored to their Western allies. Saudi Arabia is already becoming increasingly fond of Moscow and has become an easier nut to crack in talks to lower oil production for Moscow. That is crucial because the West is inclined to pressure Riyadh to keep them low and thereby drain Moscow’s budget in the hope of fomenting a revolt against Putin. Is Putin winning in Syria? It looks so and not just there. With Moscow’s relations with the West in tatters, its own hard turn East towards Beijing can only become more categorical and alas final. With an increasingly powerful and MENA-engaged China at its side, the authoritarian regimes of the world are likely to become less oriented on the West and more united in opposing it. The 21st century, in such case, will be one of the West versus the rest. It’s surely a good thing that the West has ‘democratic’ Kiev on its side (sarcasm correctly perceived).